True Detective is a character study of detectives Rust Cohle and Martin Hart, who worked a series of murders in 1995. Viewers get to know them and the case they worked on as they are questioned in 2012 regarding the old case. Are they being questioned about the murders or themselves? At first look, True Detective seems as though it’s going to be a murder mystery about how Rust Cohle (Matthew McConaughey) and Martin Hart (Woody Harrelson) will piece together the clues to the mystery of the woman they discovered naked and folded over in a cotton field, wearing a crown of antlers. 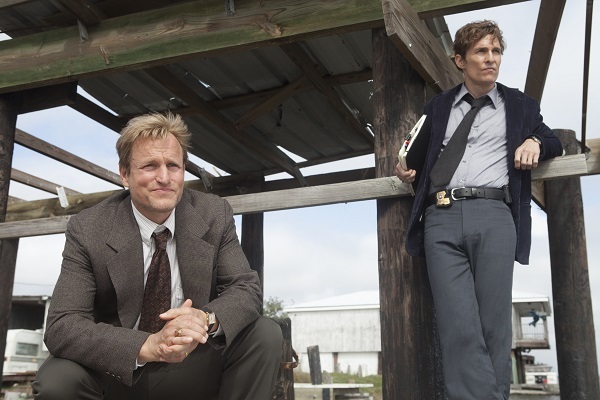 Rust Cohle and Martin Hart were detectives in Louisiana in 1995. They are being questioned in 2012 in conjunction with a serial-killer case they worked together. The murder was horrific, with a woman discovered with her head covered with an antlered crown. It was discovered she was a prostitute. Hart invites Cohle to dinner, not knowing that it’s the anniversary of Cohle’s daughter’s death. Hart doesn’t like the way Cohle sees life or talks about it, especially his lack of religious beliefs. During the interviews, it becomes apparent just how much the two men have changed in the 17 years since they originally worked the case. That first look is deceiving. Within fairly short order, it becomes apparent that the true story is about Cohle and Hart — more than likely honing in on Cohle. It also becomes apparent that whatever new evidence has come in regarding the murder case isn’t going to paint the men in a very good light. The scenes we see in 1995, when they first worked the murder case, are described to new detectives in 2012 through a series of interrogations. Cohle, especially, looks much different from the man he was 17 years ago. A deep, overly insightful man in 1995, Cohle thought the human race should join hands and walk into extinction. He was well-dressed and didn’t drink, not because he didn’t want to, but because he greatly desired it after the death of his daughter and the breakup of his marriage. Hart was in what looked like an idealistic marriage with Maggie (Michelle Monaghan), but appearances can be deceiving. Hart seemed to have a little something on the side with a secretary who delivered something to his office. Everybody has something to hide. In 2012, instead of questioning Hart about the case, they were asking about the night Cohle had dinner with his family and turned up drunk. He started to realize something was up, but he couldn’t put his finger on exactly what it might be. Hart defended his old partner, pointing out that no matter how their relationship ended, there wasn’t any question about his ability as a detective. As Cohle, McConaughey was transformed from the 1995 persona into that of 2012. Whatever happened in that 17 years had driven him to drink — every day, without interruption and without apology. If he couldn’t smoke and drink a six-pack during the interview, then it wasn’t going to continue. He was granted his beer and cigarettes. Everything else that happens in the series seems ancillary to the discussions with Cohle and Hart. Watching McConaughey in 2012 is mesmerizing. He barely speaks above a whisper, but he commands your attention. I want to know what Cohle is going to say next as much as I want Hart to corroborate it. In less than 60 minutes, two of the best actors of our generation made a murder mystery secondary to how their relationship might unfold over the eight episodes of True Detective. If True Detective does well this season, it will continue as an anthology series, with a new setting and new actors each season. If they’re able to partner two exceptional actors in subsequent seasons, the series could be entertaining and fascinating us for years to come.